The All American Baseball Academy is a year-round baseball training program servicing players in Montgomery County and Bucks County, PA predominantly, however we frequently have players from across the tri-state area as members of our Elite Tournament teams. Our goal is to develop our members into well-rounded ballplayers, students and responsible human beings. Our mission is to help each and every player reach his potential. It's not about how many games you play! It's about how WELL you play them. Our objective is for YOU to play at the highest level possible. We know what you want. It's what every serious player wants. You want to play every inning of every game and you want to play them perfectly. College and professional players compete for their spot every day. We prepare our players to develop the right mental and physical approach to compete at that level. Our players learn how to play as a team. Every player has a role. The time a player has to develop his skills is very limited. It's very important to dedicate yourself and make every minute count. That's why your decision to play for an All American Baseball Academy Elite Team is so important. Our teams are managed and trained by experienced professional coaches, Major League Baseball Scouts, college coaches and professional players. Coaches who know how to maximize your potential. The key to our success is "our ability to educate." Our professional instructors specialize in diagnosing flaws and instructing players on correcting their technique. Our staff members have no children on our teams. This is not an organization that exists for the purpose of socializing or advancing the careers of a few choice kids whose fathers coach the team, etc. This experience is dedicated to every player who joins our program. Many of the baseball academies in the region are run by people who have come through our program. Train with their mentors. We are the oldest and most reputable baseball academy in Bucks and Montgomery Counties. We have a rich history of developing great student athletes and professional players. See our Alumni Page. Since 1998, we have trained over 330 players who have been recruited by colleges like North Carolina, Stanford, Miami, Arkansas, Harvard, Dartmouth, Johns Hopkins, Florida A&M, William & Mary, Stetson, U. Conn, Elon, U. Pitt, Ohio State, Seton Hall, Delaware, West Virginia, Temple, Maryland, U. Penn, VCU, Navy, West Chester, LaSalle, St. Joe's and many more. We are the original source of training for many former players who are now coaching and instructing throughout the region. Many of our current college/ professional players return to train with us on a year round basis. Now you have the opportunity to train directly with their source of superior baseball instruction. Tampa Bay Rays, Baltimore Orioles, Anaheim Angels, Chicago Cubs, Milwaukee Brewers, San Francisco Giants and New York Mets. Sean and Tommy Coyle started training at the Academy when they were seven and eight years old. Very few players have the work ethic of the Coyle brothers. 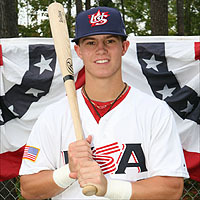 Tommy was the starting second baseman for University of North Carolina until he was drafted in June 2012 and signed a contract with the Tampa Bay Rays. Tommy made the New York Penn League All Star Team in his first season of pro ball! Sean was drafted in 2010 in the 3rd round and signed a contract with the Boston Red Sox for $1.3 Million! Sean has already made a spring training appearance with the Red Sox and is now in Class A Advanced Carolina League. Michael Gibbs from Roxborough High School started training with us at the age of thirteen and was throwing in the mid 90's by his junior year of high school. Michael was drafted by the Montreal Expos out of high school, but opted to attend college at VCU. During his collegiate career he was also drafted by the Atlanta Braves and finally by the Colorado Rockies, whom he signed with. Every year, the Doylestown Intelligencer publishes their "All Intel Team." In 2009, out of the 24 players selected to the first and second teams, 11 of those players had trained at All American Baseball Academy since the age of 11 or 12. The selections were made by the local sportswriters who cover our region. Year after year, our players continue to establish themselves as the most accomplished and dominant baseball players in Southeastern Pennsylvania. There is no substitute for high quality, professional hitting, fielding, pitching and catching instruction. The sportswriters didn't ask the players where they trained. They watched them perform throughout the baseball season and recognized their level of skill and talent. What better proof could there be? (We also had 6 additional players on the Bucks Courier Times Gold Team). In 2011, we had 23 players who trained with us selected to their respective All League teams. In 2012, that number rose to 25. For a sample CLICK HERE!